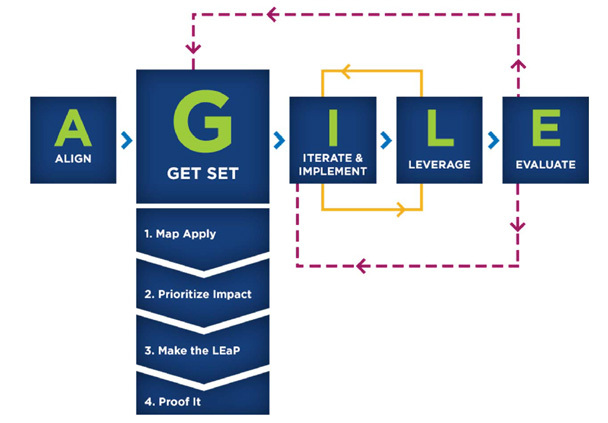 AGILE was first created for software development to replace what is known as the waterfall method but has since been applied to many other industries. AGILE is a strategy that promotes iterative and incremental design and development in order to get out parts of a project to the client instead of the whole at one time (to save time). This is actually very similar to the rapid development strategies – they are for the most part exactly the same. You should use AGILE when you meet some of the same requirements that you have to meet to do rapid instructional design. It is not something that should be used on every project. Certain conditions should be met first. 1. Analysis is completed – without a proper analysis the project will fail. 70% of projects fail and poor analysis and management are usually the cause. This doesn’t mean analysis needed to be completed for this part of the project. You might know these clients and have done other projects with them so you can take some/all of that original analysis and use it. So you are considering getting into the instructional design or instructional technology field and want to know what it takes to make it. Today I am going to explain how to get into the field – at least the corporate part. Now before I start, there is not one way or a right way per se to get in, but there are things you should know before you make that jump. What instructional strategy is appropriate for indirect instruction? What about one for direct instruction? And experiential? 2. Experience – Yes you need experience in addition to just knowing information. I want to see that you can work on a team and such. For this I suggest internships in the field. You need actual experience in the field and there are tons of internships out there. Having said that, if you have a masters + other experience I would definitely accept that as well. 3. Master’s degree/certification – You need something that shows you have the knowledge. I will interview you like crazy but I really prefer someone that I know has the basic competencies. I would hire someone without the degree but they would really have to pass a pretty tough and extensive interview where I would really ask them about every competency in the field. 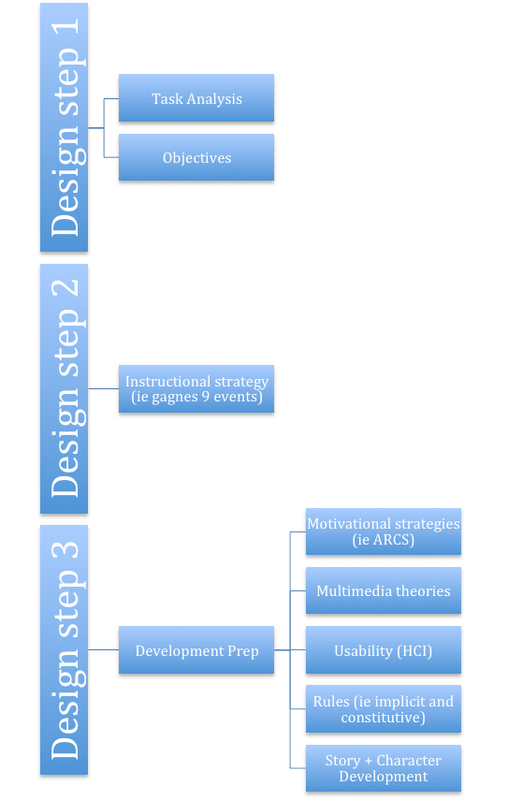 The worst thing I see in our field is instructional designers that do not actually know instructional design. While a degree is no guarantee of that, it does help. That is not to say all instructional degree programs are equal either – so yes it also matters where you went to school. 4. Portfolio – First, if you show me stuff you have done for other clients I am going to be a bit concerned as they more than likely own that work. I wouldn’t want you leaving my company and showing the stuff you developed for me. So you need to develop a few mock examples. Honestly though this is not that important unless you are really going to be an instructional developer. I can tell if you can design by setting up a few scenarios and asking you what you would do, what models would you use, why, etc. This is more important for fields like computer science and graphic art. But it doesn’t hurt to have it. 5. Technology – I do not expect you to be a tech expert or developer. I expect you to be able to discuss technology and work with programmers though. You should know what all of the latest software packages can do, when you would use them, and why. You should understand an LMS and how to be an administrator of one. You should not be ‘that’ instructional designer that knows one technology and recommends that technology before ever doing an analysis to determine if that is really the best or not. 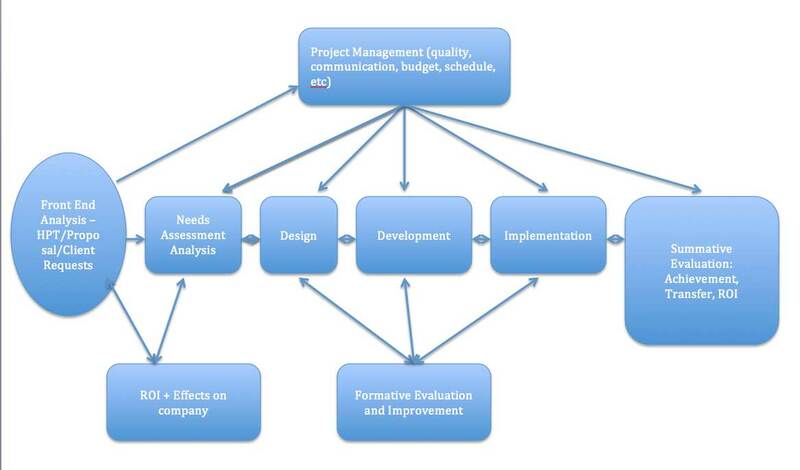 During this phase of instructional design (ADDIE) we develop our instructional product and get it ready for implementation. 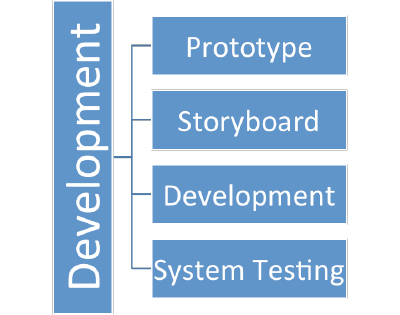 Prototype – From our design, we should build our prototype. This can be a screen shot or mock-up of screens that show what the final product could look like. It is very important to get client approval here before moving onto storyboard development. These should also look good – so get a graphic designer to design them if needed. These will help the developer and graphic designer in the long run when looking at the storyboards if these are done well. Storyboard – This is the story. Each screen (or scene/action if developing a game) will be depicted. Everything we have done in design will aid in the development of the storyboards. The client should be able to look at these (and see the visual in the prototype) and have an exact idea of what the final product will look and feel like. Again, these need to be signed off on. System Testing – During this phase the LMS, network, etc. should be tested (if needed) to ensure that the servers and network are prepared for the implementation. This is the time that the IT team and ISDers work out any system glitches, especially if delivering this to many users. This way when implementation is ready the rollout will run without glitches. Here is my image depiction of an instructional analysis. Project charter – This should not be confused with the project charter in the PM process. However this may contain much of the same information. This should contain the problem, project managers, contact info, background to the problem, ROI information, Project goals, budget and schedule summary. This document will be filled in and modified throughout the whole ISD process. It is usually a 1-2 document. Learner analysis – Who are the learners? What is their level of education? Can they use computers? smart phones? What is their age? Motivations? What are their work conditions like? What is their job like? Do they prefer a certain kind of training or are they used to a certain kind? (remember if they are not used to it then you need to go through a change process which might involve training and communication on the new process) *Note here do NOT look for learning styles as there is much research against them and they do not help with curriculum development. Learning preferences are NOT the same as learning styles. Context analysis – What kind of conditions will the learners use these new skills? What are those skills? What kind of conditions will these learners be trained in? Computer labs? Classrooms? On the job? Really answers two questions – where/how will they use these new skills and what are the learning environments like? Technology analysis – What technology is available? What technology are the users used to? Computer labs? Projectors? ipads? etc. This information may be included in the other analysis sections however I really like to break it down and have this section separate so that developers looking at this document do not need to read between the lines to help give input on technology solutions. Knowledge of performance analysis (*performance analysis should be completed prior to needs analysis in the front end analysis not described here) – Is there anything else we can add to this? Document analysis? Prior project lessons learned? Results from front end analysis such as surveys/observations? All of that can go here. And if there was no front end analysis done (which is why I include this section) then make sure you have data to add here. If a front end analysis (a good thorough one was completed) then this section may be omitted. Gap analysis – This is the section where we analysis the problem and analysis to come up with a solution. Current state – What is the current state that needs to fixed? Desired state – What is the end desired state? What were the companies goals and what are the new ones for this project? Potential solutions – What are all of the potential solutions? How long will each take/cost? Impact of those solutions – How will those solution impact the company? Which departments will those solutions impact? Are any department already doing this? What is the ROI for each of those solutions? How much will each cost? How long will each take? Solution selected – What solution is recommended to the client? Goals – What are the goals of this project with this solution? Can you classify them using something like Gagnes categories of learning? (this will help with your task analysis). Do learners have the skills required to complete each of these goals? There are many reasons why one goes into instructional technology. I personally went into the field because I loved computers and making websites in the late 90s. I have written about this topic before and this is just really an update to my original article. So what are ten reasons to go into this field? 1. Good pay. Starting salaries between 55-70k (depending on location). 2. Average 5 year salary is 75-90k a year. This goes way up if you are in a management role. 3. Chance to move to high ranks in companies. Many instructional designers are promoted to project manager after a few years and can move up into very senior roles from that point on. 4. Can enter with any bachelors degree. Only requirement is a bachelors degree in any field. 5. Great 2nd career. Great for teachers trying to leave teaching to go into the corporate sector. You basically become a teacher for the corporate world. 6. Lots of jobs. Lots of jobs everywhere. Although keep in mind obviously cities have more jobs. 7. Work from home – many jobs in our field are allowing you to work from home when not on client site. 9. Can work in the corporate world, Government, higher education, or K-12. Really any sector. 10. Every company needs instructional designers. Yep its true. Every single company needs training and guess who designs it? Yep, instructional designers. Sounds to good to be true? Well it is and isn’t. Our job in a lot of work and many instructional designers are hard workers. It requires a masters degree – so we are a smart bunch (and our master’s programs are tough). When we are finishing up a project there can be long hours and our job involves thinking and strategy – so its not a cake walk. However, we also gets nice breaks in between projects, good pay, good bonuses, etc. Overall its a great career for anyone – with the right kind of motivation, cognitive ability, and love for technology. Is it worth it for Instructional Designers to get the PMP certification? Here are some sites that debate the issue. I personally believe it is if you are a PM and it can only help your resume.